I want to leave a message for my loved ones who will be left behind after the Rapture. Is there a resource readily available? 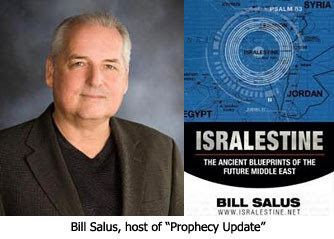 Bill Salus: Nathan, we discussed earlier the three Bible Prophecy Insights videos. The first one dealt with the prophecies regarding Christ's First Coming. The second one dealt with the signs proceeding His return. And, the third one dealt with the Rapture. Nathan Jones: Correct. We wanted to start out by hitting the main three topics that this ministry teaches about. First we laid the foundation by telling people why they should consider Bible prophecy. Can it be valid? Is it accurate? The accuracy of Bible prophecy is the foundation we build our other teachings off of. So, we started with the first one called the "Accuracy of Bible Prophecy." The second Insights video is titled "Signs of Jesus' Return." The video shows that we can look all around and easily see all the different signs and prophetic events that are happening all around the world which inevitably point to the Lord's soon return. The third and probably the most important Insights video at least for Lamb & Lion Ministries teaches people about the Rapture. As a reminder, the Rapture concerns the soon return of Jesus Christ to take His Church out of this world and bring us to Heaven. The third video is simply called "The Rapture." Bill Salus: For those that aren't familiar with the other video you produced, Nathan, you created a spectacular short video about the aftermath of the Rapture. What, is it about 10-15 minutes of viewing? Nathan Jones: Yes, it's 15 minutes long. Bill Salus: Is it also available on lamblion.com to watch? Nathan Jones: We put it linkable right off of our homepage just like the Bible Prophecy Insights videos. We also put them all over YouTube and as many video networks as we could. The post-Rapture video is called Jesus Came, What's Next? We also have it listed as "Did many people disappear?" It's become our ministry's "left behind" message. Lamb & Lion Ministries exists to evangelize the lost now, but we can also evangelize the lost post-Rapture thanks to all this technology allowing us to leave messages behind. The purpose of "Jesus Came, What's Next?" is to teach the people left behind after the Rapture because they hadn't accepted Jesus about who Jesus is and what will happen to them during the coming Tribulation. It's been out now for about two years. I'd encourage anybody who wants to leave a left behind message to a lost loved one, family and friend who haven't accepted Jesus as Savior yet to leave them this video. They can view it online, and they can leave one on a DVD. Get the video out there, that way after the Rapture happens if you'd spent your life witnessing to your brother or sister and they have never accepted the Lord as their Savior, after the Rapture they can get their questions answered about what happened to you and other believers. They can remember, "Hey, wait, my brother or sister gave me that video and now they're gone, so what was it they were telling me all about?" They can pull out this "left behind" message and you will still be witnessing to them even after you've left with the Church for Heaven. Bill Salus: I remember hearing Dr. David Reagan say about the Rapture video that he couldn't get through the whole video without crying. I must confess the same. I'm guilty of the same thing. I was very emotional watching that video. I would suggest to believers that they need to watch Jesus Came, What's Next? because it stresses the importance of the Rapture and the days in which we live. We are living in a time when the Rapture could happen at any "twinkling of an eye" moment. Nathan Jones: It's amazing how the Lord has used our "Jesus Came. What's Next?" video already, Bill. Soon after we released it we had a gentlemen call the ministry. He was very hard to understand because he was mumbling and just livid. He revealed that he was a fourth generation warlock and the head of his own coven. Well, after a coven meeting he said his coven members went to his home to watch a Harry Potter movie, but instead they ended up watching "Jesus Came, What's Next?" Frantically, he protested that he had no idea how it got there. He didn't know who put it in his DVD player, but he was calling the ministry demanding to know who put the video in his DVD player. Obviously I was like, "Um, I'm sorry, Sir, I have no idea." To my surprise the warlock exclaimed, "I've felt so much love through that video. I have never known love in my life. I was born into the occult and have been so my whole life." Well, it had to be a number of calls back and forth with him before our Finance Minister finally led him to the Lord. You've read in the Bible about the calves being excitedly released from the stalls, right? Well, he was just like that, feeling so free. He's called since to say he's jumped fully out into the world to tell everybody about the Lord. Sadly, he had to flee for his life as his coven was now out to get him after his conversion. But, he experienced a total transformation. Even talking to him, he was like a different person. The voices — the demons — that he said were in his head were gone. He says he's living to share the Gospel. So, the Lord is using our "left behind" message with people even today in ways I could never have imagined. We're really excited! And, obviously, anything we produce comes to nothing unless the Lord blesses it and uses it. Bill Salus: God's prophetic word is a seed that you've been called upon to plant that even now the Lord is nurturing. "Jesus Came, What's Next?" is just one excellent example right there of how the Lord works through these things at such an amazing level. You've just told me about one story you've heard about. What about the ones you haven't heard about that certainly must be taking place? God's amazing! I certainly invite the listeners to watch Jesus Came, What's Next? In the next part of this interview on advancing the Gospel through social media, Bill and I will look at how math proves the accuracy of Bible prophecy.